As someone who was just three years old when the first Star Wars film was released in 1977, I am of the generation that is the most influenced by the imagery and ideas of stormtroopers, X-Wing Fighters, and ‘The Force’. Perhaps the movies also subtly influenced my interest in the Middle Ages. When George Lucas wrote up the screen play that would become Episode IV: A New Hope, he would make use of Earth’s history to help create his galaxy far, far away. Those influences range from ancient history to modern American politics, but many scholars believe that the medieval period left the largest imprint on the story. The two most significant influences are in how the original trilogy has many similarities to Arthurian legends and how Jedi Knights are modelled on medieval warriors. The parallels to the Arthurian cycle are obvious and numerous. For example, Luke gets his knowledge of the Jedi Knights and their noble values from the wise, mystical, an Merlin-like character, Obi-Wan Kenobi. These knights are custodians of peace and justice in this galactical civilization, and they are armed with appropriate weapons. Luke Skywalker’s Excalibur is a light saber, not a clumsy storm trooper blaster that kills at random, but a clean clear ray that dispatches its deserving victim with finality. 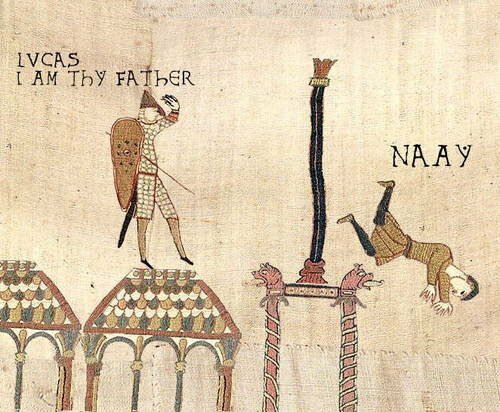 One of the first similarities is between the story of Luke Skywalker and King Arthur. Both grow up without knowing who their true parents are, but soon come to meet their mentor – Arthur has Merlin, while Luke gets two: first Obi-Wan Kenobi, and then Yoda. They each get to claim a powerful sword, Excalibur and a lightsaber, and begin their quest against the forces of evil. An important plotline in the original Star Wars trilogy is the love-triangle between Luke, Leia and Han Solo, which is reminiscent of how Arthur marries Guinevere, who then falls in love with Lancelot. However, Weisl notes that big difference between the Arthurian Romance and Star Wars is that the latter gives you a much happier ending. Once we learn that Luke and Leia are siblings, it clears the way for Han and Leia to become the romantic couple. Meanwhile, Guinevere and Lancelot’s affair leads to tragedy and is partly the cause of the fall of Camelot. Moreover, Luke himself does not completely follow in Arthur’s footsteps. In the medieval version, Arthur becomes king, but his reign ends when he has to fight his illegitimate son Mordred. At the Battle of Camlann the son is killed and Arthur fatally wounded – in the end both are destroyed, although the medieval writers leave room for Arthur to return – maybe they had a sequel in mind too ;) However, in Return of the Jedi, the final clash between Darth Vader and his son end with two saving each other and destroying the evil Emperor. Vader dies, but the story ends on a much more positive note than the typical Arthurian tale. Another part of the Star Wars saga that has a strong connection with the Middle Ages is the creation of Jedi Knights. In his article ‘Elegant Weapons for Civilized Ages: The Jedi and Warrior-Monks throughout History,’ Terrance MacMullan finds that three warrior groups influenced the way the Jedi were conceived in the films. The first are the Shaolin Monks, who were established in China around the 5th century AD. The concept of the Force, a kind of invisible living energy that can be found in all things, is very similar to the Shaolin’s concept of Qi. Shaolin masters believed that through study and training one could make use of Qi to improve their senses and abilities, even to heal or use in warfare. Like the Force, which has its Light and Dark sides, the Yin and Yang of Qi are opposite forces that can be used for constructive or destructive ends. The second group of warriors are the Samurai of Japan. While the armour of the Samurai (in particular their helmets) were the inspiration for look of Darth Vader, the philosophy of these warriors also has much in common with the Jedi. Like the Shaolin, the Samurai were followers of the Zen Buddhism religion, which according to MacMullan “teaches that in order to truly understand all things, one must let go of the conscious mind that divides the world according to categories and must cultivate mushin or ‘no mind’.” In A New Hope Kenobi teaches Luke to “let go your conscious self and act on instinct”, a lesson Luke is able to use when he makes the “one-in-a-million shot” that destroys the Death Star. While the Jedi were guardians of peace for the galaxy, the Templars had a similar (if a little less ambitious) goal: they were formed in the early twelfth-century to protect the recently conquered Holy Land and its Christian pilgrims from Muslim armies and brigands. Over the next two centuries they became an increasingly important part of the Christendom, not only serving as the elite military for the Kingdom of Jerusalem, but also establishing monastic centres throughout Europe. The power and wealth of the Templars would make them a target, and ultimately would lead to their fall. Under allegations of heretical practices, the Templars were arrested and put on trial. Many of their leaders would be executed and the order was disbanded. This fate would be echoed in the film Revenge of the Sith, when the Emperor unleashes his evil plan to destroy the Jedi. While the Jedi are able to return and defeat the Emperor, in history the Templars made no such comeback. University of Wyoming Visiting English professor Ryan Croft explains some connections between works such as “Dante’s Inferno” and “The Faire Queen” and the famous George Lucas trilogy.